Tim Dodman is a freelance conservationist and development worker with wide international experience based on the remote Scottish island of Papa Westray. Tim’s main work is in wetlands conservation in Africa, where he has lived in Somalia, Zambia and Senegal, with missions in around 40 countries. Tim’s main areas of experience are in project/programme development, training / capacity building, community-based wetland conservation, biodiversity and flyways. Tim has a sound knowledge of wetland conservation in Africa and of the continent’s fauna and habitats. He has been closely involved in the African Waterbird Census and Waterbird Population Estimates for many years, and is a co-author of the Atlas of Wader Populations in Africa and Eurasia. Tim worked for Wetlands International (1995-2001) based largely in Dakar, Senegal, setting up the Africa Programme and overseeing the launch of major projects and new offices, and has since actively served as an Associate Expert. Earlier, Tim led a pioneering survey of the black-cheeked lovebird in Zambia for BirdLife International (1994), following on from three years with the WWF Zambia Wetlands Project (1992- 1994), which included devising training programmes, liaison with local chiefs, and supporting community groups and parks staff. Tim has also worked for RSPB Scotland (1990/91) and in Somalia (1987-88), Nepal and Brazil. Tim has published widely, and was lead author of the recent Wings Over Wetlands Flyways Training Kit. Other publications include IBAs in Guinea-Bissau (2004), Conservation Strategy for the West African Manatee (2008) and papers on waterbird migration strategies in Africa. 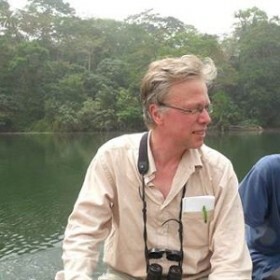 He has served on various committees, including BirdLife’s Council of African Partnership TAC (since 1995), and is Treasurer of the West African Ornithological Society. He has an MSc in Resource Management (1989/90) and a BSc in Agricultural Science (Animals). Living in a small community of 75, Tim also fulfils various island roles, including fire-fighter, fisherman, tour guide and school bus driver.